Your frustration with acne and unsuccessful treatment ends here. Clenziderm M.D. 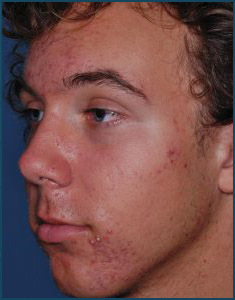 Acne Therapeutic Systems are different than other acne products. They are the only systems that use the patented SoluZyl Technology to penetrate to the root of the pore and clear acne where it starts. Clenziderm M.D. Systems are clinically proven acne therapies from Obaji Medical Products. They are the only physician-dispensed acne systems that use the patented solubilized form of benzoyl peroxide. Proven to provide clearer, healthier skin—-Fast. How Does Clenziderm M.D. Work? Unlike other benzoyl peroxide acne products, Clenziderm M.D. Systems contain a unique, patented solubilized form of 5% benzoyl peroxide. Because it’s solubilized, this powerful medication can penetrate deep into your pores quickly for rapid results. How Is Clenziderm M.D. Different From Other Acne Treatments? The bacteria that causes acne (P.acnes) grow at the root of hair follicles deep inside your skin. Most benzoyl peroxide treatments are formulated with micro- or macro-crystals that remain primarily on the surface of the skin. The molecules in Clenzidem M.D. are 1/10,000 the size of other benzoyl peroxide molecules, so they can penetrate deep to kill acne where it starts. As we age, our skin is affected by many environmental stressors, especially UVA and UVB rays. These stressors cause damage to both the superfical and deep layes of your skin resulting in photodamage. If this process continues, one will develop fine lines, wrinkles and age spots. Additionally, collagen and elastin begin to break down, causing the skin to lose resilience resulting in deeper wrinkles and sagging skin. 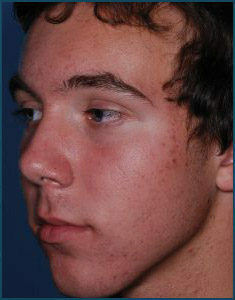 We have been prescribing the Nu-Derm System for many years providing patients with younger and healthier looking skin. The Nu-Derm System penetrates below the surface of your skin to transform skin cell functions at the cellular level and correct the damage within. The prescription-strength system exfoliates old skin leaving healthy and new skin. Ask Dr. Burger and his staff for the specific Obagi product(s) that would produce the best results for your skin. For years I suffered with dark spots on my face and was embarrassed to even go out in public. These spots covered me entire face from my forehead to my chin. I would try and cover the spots up with make-up, but make-up made spots darker and more visible. 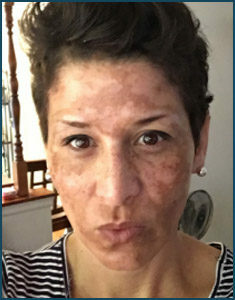 I tried product after product without ever seeing any improvement, I began to lose hope and told myself that I may have to just live with this mask and hide behind makeup for the rest of my life. One day my daughter was searching for doctor’s in our area that treated women with my same skin condition and stumbled across Dr. Burger’s office. At Dr. Burger’s office, I was introduced to Michelle who works with women who are dealing with the same skin condition as I am. My experience with Michelle has been life changing. Michelle gave me the support, encouragement and provided detailed step by step instructions along with a product that would improve my skin tone. Michelle not only was treating me as a patient she became my friend. 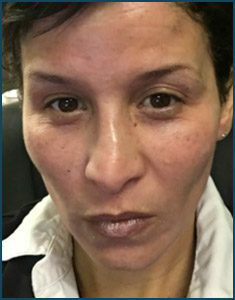 I have been working with Michelle at Dr. Burger’s office for 5 weeks now and my skin looks amazing! Not only are the dark spots almost complete gone, I look years younger. I pray my story will help other women who are dealing with the same skin discoloration gain hope and encouragement that there is an answer.